(15 May 2018) This issue will rig a sharpie sprit sail. The 1 June issue will rig a balanced lug sail. ...WILL TAKE PLACE ON JUNE 8 AND 9, ALWAYS ON THE WEEKEND BEFORE FATHER'S DAY WEEKEND. THIS AT THE RINGNECK LOOP AT THE NORTH SANDUSKY CAMP GROUND. THE CAMPGROUND IS OFTEN FULL BUT WE HAVE ALREADY RESERVED SITES 25 THROUGH 29 SO THE END OF THE LOOP IS OURS. THANKS TO ALL WHO HELPED NAIL THEM DOWN. SEVERAL TENTERS CAN SHARE A CAMPSITE. HOPE TO SEE YOU THERE! Robert Jacobs' kids try out the new Robote, a two week project. 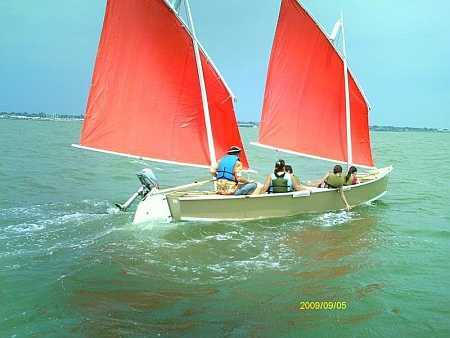 My first homebuilt boat, in 1981, was a Bolger Teal rigged with a 59 square foot sharpie sprit sail. Next boat was the Bolger Jinni with a 96 square foot main and small mizzen, both sharpie sprits. Later came Birdwatcher with a 126 square foot sharpie sprit. I've used the sharpie sprit on lots of my own designs thinking it about the best sailing cheap rig (although it has its disadvantages too). In this essay I'll pass along what I think I've learned about it. The sharpie sprit mast is actually one of its main disadvantages...the mast needs to be long compared to something like the mast of a balanced lug rig. 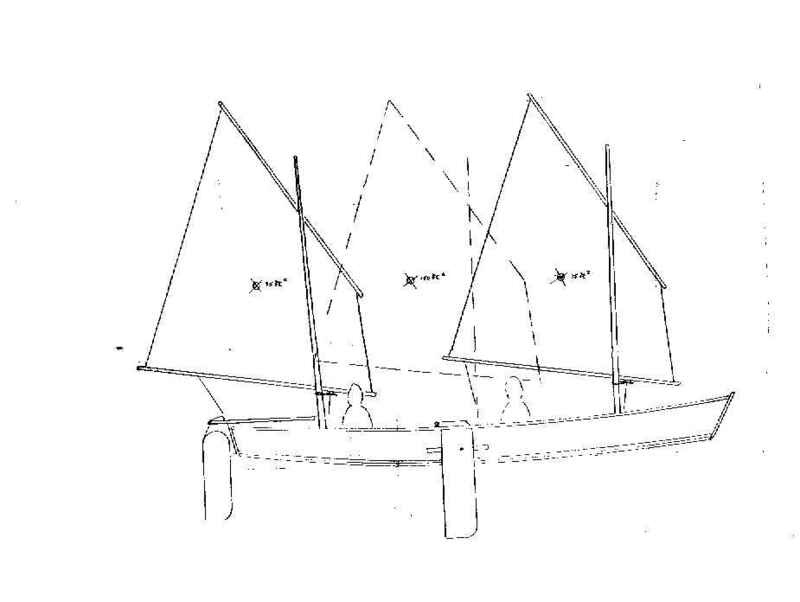 For example my 12' Teal needed a 16' mast to set enough sail to be interesting, the Jinni needed a 21' mast on its 15' hull, and the Birdwatcher needed a 24' mast on its 24' hull. In general the mast needs to be longer than the boat, sometimes by a goodly amount. That causes problems in trailering and cartopping, especially with the smaller boats. It's at its worst with a small row/sail boat like Teal. 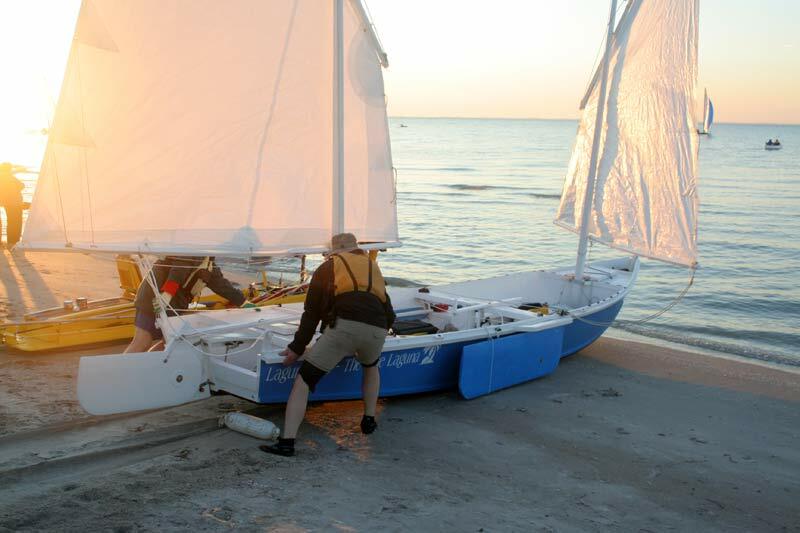 If you have to row the boat after sailing, you need to leave the rig standing. Where are you going to put a 16' mast in a 12' boat? If there is any wind about, rowing the boat with the rig standing is very difficult. On Jinni I put a set of crutches fore and aft to stow the rig. The crutches were off centerline so I could launch and row the boat with the rig still stowed - very important. Never stow such a rig on centerline if you don't have to. Actually the mast length problem would be no different for any triangular sail rig. As for mast material, low tech wood is the way to go. I've tried aluminum and other pieced together solutions and I'll report on them some issue. But the single straight stick seems to be the best. The three boats I mention all had masts with square cross sections (even though the Birdwatcher was supposed to be octagonal). The square masts are a lot easier to build than the octagonal or round masts. I suspect they work about as well. They are stiffer for the size and can easily be built hollow like a box if you want, although if you crank through the numbers you might find that a hollow mast in the size we are talking about saves very little weight. But I don't think a mast should ever be made of a single piece of wood, at least not the wood my sources carry. Always laminate from at least two layers to minimize warping. Sharpie sprit masts are usually unstayed, that is they have no supporting guy wires. That means a heavier mast but a simple and easily assembled structure. I think a stayed mast would work as long as you were on the lookout for interference between the wires and the sprit as it projects forward. I might add that from a practical standpoint the 24' Birdwatcher mast, which weighs perhaps 35 pounds, is about all one man can put up by himself with repeatable ease. Even then you must use care, practice and patience and be in control of the thing all the time. You must really rig the boat on shore. 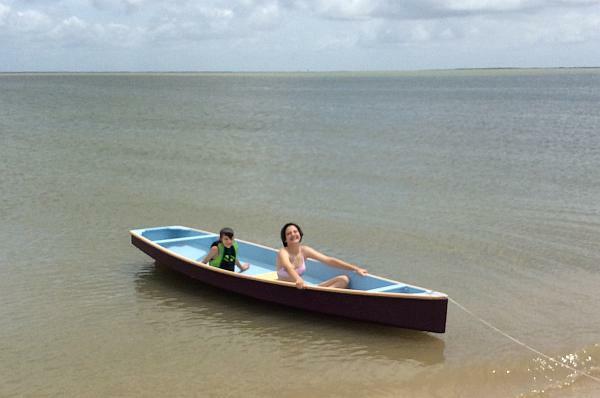 The small skiffs often don't have the stability needed to allow you to stand up in the boat trying to balance a 16' stick on end. In rough water it is not possible without good luck. And with the larger ones you may have the stability to try to raise the mast while afloat but any passing wave that rocks the boat as you stand a 24' mast on end will invite disaster. Up until a month ago all the sharpie sprit sails I had made were of real Dacron sailcloth using instructions from SailRite books. As far as I'm concerned they all went quite well. The SailRite books contain all the information you need although the book I used, written 20 years ago, was a bit jumbled. But since then I think I've learned a few things needed to tweak the general instructions to sharpie spritdom. For one thing, almost any sharpie sprit sail will benefit from having its leech (trailing edge) hollowed out. If you don't do that the leech will flutter with a loud motor boat sound in higher winds. Usually 2 or 3" on a 20' leech might be enough. I don't think there is any special number, but you do have to hollow it out. Next, the foot of the sail should be cut more or less as if the sail had a boom which is to say with some "round". I've always use the SailRite instructions for getting the round. I've seen Phil Bolger write that the foot should be cut straight. But I can't see that if you are looking for shaping in some camber. My feeling is that the tension in the foot of these sails is so high that the foot is going to straighten out due to the load no matter how you shape it, so it ends up as if you had laced it to a straight boom. Next, the luff of the sail needs a lot of "round" mostly to allow for the backward bend of the unstayed mast, which can be considerable. Here again SailRite gives good guidance in suggesting the mast be supported at it ends, a weight equal to half the sail area suspended in the middle, and the resulting deflection "mapped" and applied to the luff. The "round" needed to allow for sail draft shaping is added to the deflection round but it is usually a lot smaller than the deflection round. You might be surprized how much round the luff may need - a 14' luff may need 5" or 6" of round, especially if the mast is limber! As for allowance for draft, I think a camber of 7% to 10% is fine. I recall somewhere that Marchaj, who wrote the book on scientific testing of this sort, said there is no reason to ever give a sail more than 10% camber by any testing he has seen. Lastly, I've been experimenting with a small polytarp sharpie sprit sail recently and should have a full report with "how to" within a few months. This is where the sharpie sprit sail starts to get interesting. Because the sprit must be attached to the mast well above the foot of the sail, the sharpie sprits of old could not use a regular halyard. If they did so, the sprit attachment would interfere with the normal sail attachments of the time - hoops or lacing. As the sail is lowered with the halyard, the hoops or lacings needed to pass over the sprit attachment and there is no simple way to do that. So traditional sharpie sprits had no halyards! The sail is tied to the mast head forever. You can never raise and lower sail in the usual way. Once you accept that you have no halyard, some economies become apparent. Not only are the halyard and block eliminated, but the mast compression that results in the downward pull of the halyard is gone (as it is in high tech rigs where the halyard is secured over a stop at the top of the mast as with a Hobie cat). And the mast can be thinner up top for that. I think the top of the Birdwatcher mast, 24' long overall, is no more than 1" square. Not needing a halyard allows for a very simple sail/mast connection, indeed. Bolger likes best simple ties every 18" or so around the mast. If one tie fails it is of little consequence. This is what the Birdwatcher used. The sail stays tied to the mast at all times. Bolger suggested a way to furl and stow such a rig. 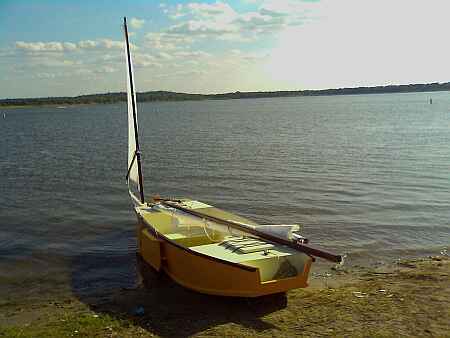 Here is a photo of my Birdwatcher with mast and sail furled. The sprit has been stowed, the sail rolled up like a sausage and the roll secured to the mast with a bungee. 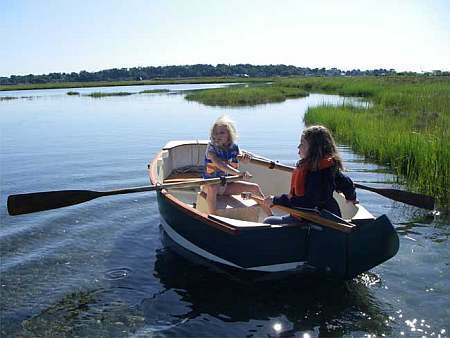 (On a small boat you can actually roll the sprit up inside the furl.) Looks great and simple doesn't it. There were two problems with this method of stowing. One is that wind can get into the roll high above the tie and unroll the sail making for uncontrolled thrashing and noise and danger. It can undo you with its violence if you try to furl the rig say at the approach of a thunderstorm which later produces very strong wings. I found a nice easy solution. I tied a light line to the masthead which led down the side of the mast to a cleat near the deck. After I had the sail rolled up I would uncleat that light line and wrap it around the sail/mast working from the deck and spiraling the line around and around. Tug hard and recleat the line and the sail was secured from tip to toe. And that is how the rig was stowed for trailering too. Never came loose. But I never solved the second problem with this furl. A sail rolled like this will eventually take a permanent curl at its trailing edge. It can't be good for the sail shape. The only thing I could think of to solve this was to roll the sail a different way each time. Simple lacing works well too. There are lots of lacing schemes but here are two I tried with Jinni and both worked well. Actually these lacings can work with a halyard given some tricks which we'll look into next time. I found the masthead lacing to be a special challange. The sail needs to be pulled up at the masthead and also pulled close to the mast. With simple ties, two separate ties will do the job. But with lacing you need to try to give a special extra loop around the mast at the top grommet so that the lacing pulls both up and into the mast. Be ready to tinker. After I had tried all of the above with Jinni I went to the method the plans called for - standard sail track. 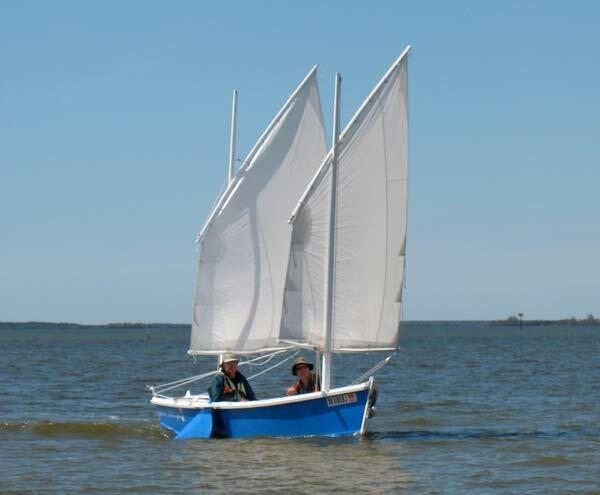 I found an oldster in selling 20' of sailtrack for $20 in Messing About In Boats classifieds and scooped it up because now the stuff costs $5 a foot if you can find it at all. It worked perfectly, better than all the lacing schemes. But if I had to pay retail for the track, I would go back to lacing. 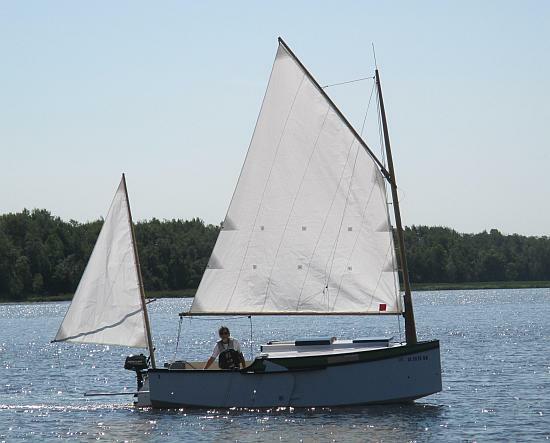 I think in many ways that the old traditional ways of rigging boats are coming back because the materials, like sailtrack and Dacron sailcloth which made the traditional ways obsolete, are now getting too expensive to consider. In a lot of ways the sprit makes the rig into a bow-and -arrow affair and makes the sharpie sprit a high performer. The sprit itself is in compression and can usually be fairly light. I used a 1-1/2" square sprit for Jinni's 96 square foot main and a tapered 1-1/2" x 3-1/2" sprit for Birdwatcher's 16' sprit. 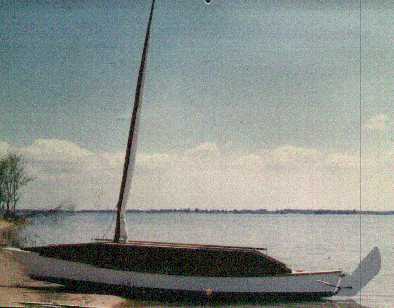 The sprit itself sort of floats free with its aft end tied to the sail's clew, and usually attached to the sheet there. The fore end is attached to the mast with a tackle called a "snotter" More on that later. By varying the tension in the snotter you can preload the mast bend to what you want and that varys the draft of the sail to something you want. It's actually quite adjustable although there are limits to it all. So this very simple rig can do things for which other boats need adjustable stays, etc. I always found the thing works very well. I have a feeling that, as with most "preloaded structures", the preloaded bendy mast retains the shape that you put into it until the wind force overcomes the preload. So the sail shape will stay constant until that wind force is attained, the sail shape does not change with the wind below that threshold. So I've always felt that the rig should almost always be preloaded to some degree. I never bought into the idea that one should set the snotter tension light for light winds and high for high winds. I kept the snotter tension high all the time and hoped for a constant sail draft and shape. One major point about the sprit geometry is how high up the mast the snotter attachment should be. The higher up you go the greater the tension in the leech and foot and the more rigid in general the arrangement. I should mention now that another advantage of the sharpie sprit is that it is "self vanging" which is to say the clew does not lift up as sheet tension varies as with a normal sail. With a regular boomed sail, the sheet pulls downward on the sail and boom to resist the upward pull of the leech. 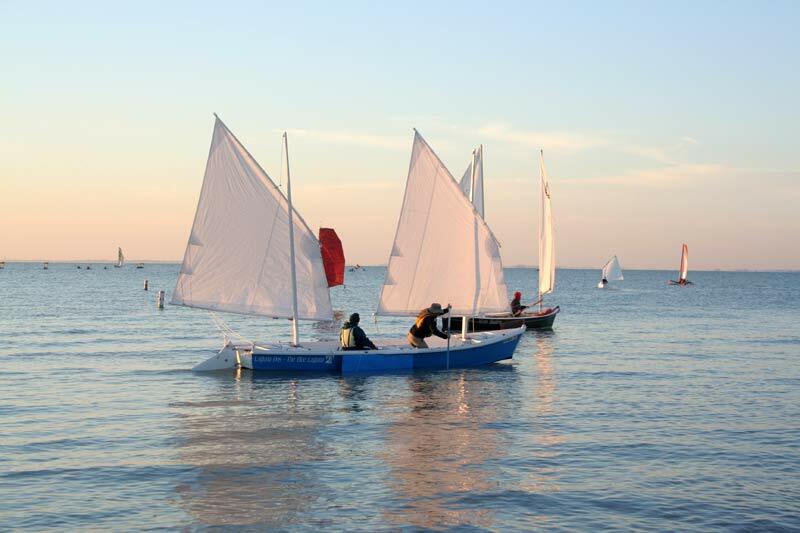 When the boom is swung forward as when running downwind, the sheet usually no longer pulls downward and the boom usually lifts up. That allows the leech to go slack, the sail looses its shape and sometimes its control. So often regular boomed sails have a vang that runs from boom downward and forward to the mast to eliminate the lifting of the boom. The sharpie sprit doesn't need a vang because the sprit is always pushing the clew down. The greater the angle between the sprit and foot, the greater the affect. So sometimes you might see the snotter tackle attached up quite high to take full advantage. I suppose the optimum would be when the sprit sort of bisects the angle formed by the leech and foot. But it can be overdone from a practical standpoint and here is why. On both Jinni and Birdwatcher I've had the snotter attachment break or rattle loose while underway. It only happens in bad conditions, course. You need to repair it quickly because you won't have control of anything until you do. If the snotter attachment is more than chest high, you will be in danger at repairing it. Having to stand on a deck to effect the snotter attachment is a total no no as far as I'm concerned. You won't be able to do it in the bad conditions that caused the failure to start with. So that's why I place my snotter tackles somewhat lower than some other designers and builders. One thing to keep in mind about the sprit is that it sometimes must be rigged very quickly. Another thing to keep in mind is that if it comes loose you loose everything! Here is how I like to connect the sheet and sail to the sprit's aft end. A simple open based cleat is attached to the sprit there. The sheet has a stopper knot about two feet from its end and is led through the base of the cleat until the stopper knot bears against the cleat, then through the sail's clew grommet, and the belayed back on the cleat. Be sure there is enough rope beyond the stopper knot to do all of this quickly. Variations on this are that on smaller boats it can be nice to leave the sheet permanent to the sprit, in which case a second stopper knot can be tied in above the cleat, capturing it. Another variation is to have a snap hook tied in to the end of the sheet so that instead of having to belay the sheet after looping it through the clew, you simply snap the hook into the clew. Here is how I like to connect the snotter tackle. In my opinion all snotter tackles should be at least 2:1 to allow power to easily preload the mast. 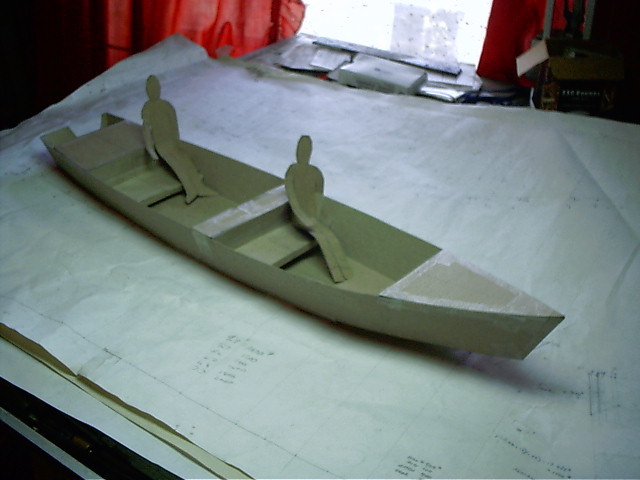 So a small sail, say less that 100 square feet, should have something like in Figure A. Again an open based cleat is attached to the fore end of the sprit. A snotter line is prepared with a stopper knot and passed through the base of the cleat, around the mast and back to the cleat where it is belayed. Some sort of eyepad will be needed on the mast to keep the snotter located on the mast. For larger boats, the multi part tackle shown in Figure B is suggested. It can be put on in an instant with the snap hook. The end of the sprit is slotted to take the loop holding the block and the slot needs to be just the right width to allow a press fit of the loop rope. This is the rig I use on Birdwatcher. The snotter lead is then lead down to a belaying pin near the base of the mast. My cross seats are supposed to be big and comfortable and removable to give sleeping room on the floor. Each crewman has his own stateroom. 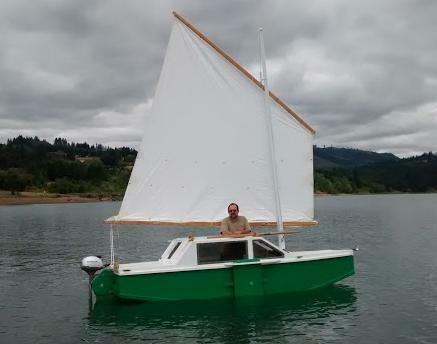 I think the single sail option would be preferred if sailing solo since that fore mast is way up yonder and one may not be able to handle it and the tiller at one time. I think both Gordo's boat and the Blue Laguna have been modified in details from the blueprint but the rigs and basic hull features all look correct. I've noticed that no one takes sleeping floor space as seriously as I do but that is OK.
Well, I was thrilled. My main caution would be that this probably is not a good solo boat due to its size and split rig. I think it might be a good family boat in that there is plenty of room for everyone and a rope for all idle hands to play with. The other caution might be that, even though the boat has big buoyance boxes, it also has large cockpits to swamp in a knockdown and it will roll upright with a lot of water to bail. So you note on Gordo's boat he has inflated fender tied to the mast head, an idea to reduce the carnage of a knockdown. Plans for Laguna are $45. It is all simple nail and glue construction needing six sheets of 1/4" plywood and five sheets of 1/2" plywood.